This is the T Page of our A to Z guide to plants -- how to care for them, landscaping with them, and cooking and healing with them. No matter how you identify it, this is a wonderful tree bearing four to six inch brown lumpy and a little hairy pods with sticky tamarind paste and seeds enclosed. In good times hundreds of these pods hang all over the tree. Over the years the trees will grow to be from thirty to eighty feet tall and will be about two thirds as wide as they are high. Benefits: "Tamarind is full of antioxidants which help prevent cancer. 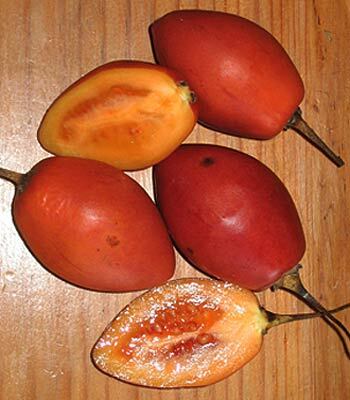 This sweet and tangy fruit powerhouse is also an excellent source of vitamin A, B1, B2, B3, vitamin C and folic acid." Thanks Yahoo. Photographed: This beautiful tree was photographed along side the road in our neighborhood in Montserrat. 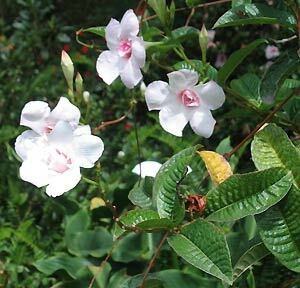 Planting & Care: Tamarinds like good loamy soil and lots of rain. On the down side they don't grow very quickly, but on the up side they are resistant to heavy winds which in Montserrat was a genuine blessing. Full sun is their favored location, though they will put up with a bit of shade. When young they do like being fertilized. 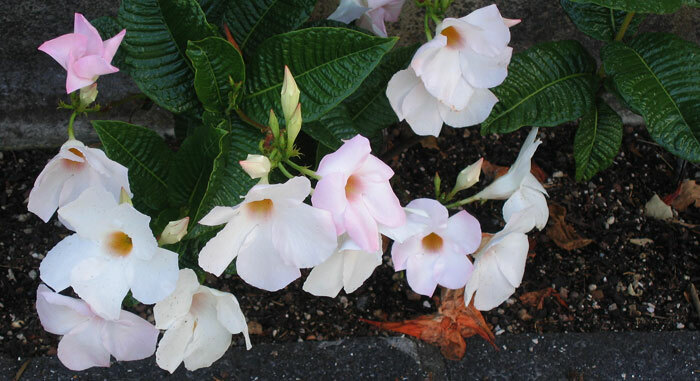 Planting and Care: This odd looking plant will tolerate a wide range of light situations, but does best in semi shade as long as it receives regular rainfall or routine watering. 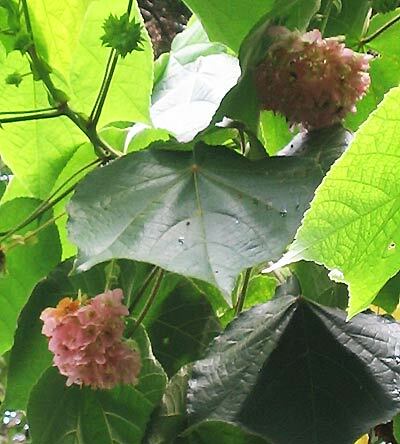 This is a small tree growing to be about 20 feet tall when mature as in the photograph or it may be considered a shrub. 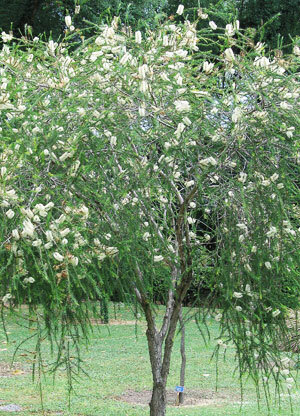 Benefits: This tree has provided medicinal benefits in Australia for more than a century. It has been used topically for infections of the skin and in a variety of other applications. Planting and Care: Melaleuca likes to grow in full sun in a variety of moist soils. This plant reminds me much of pansies for its soft petaled flowers. It is one of my favorites. 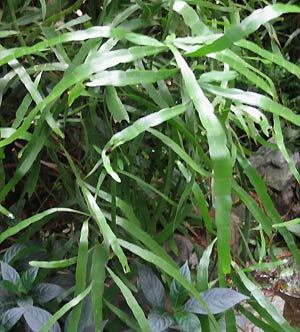 Its foliage is a waxy grayish green, also very appealing when the plant is not in bloom. Photographed: To the right in the Blithewold Garden in Bristol, Rhode Island, in 2013. Below on the right as a bouquet in the kitchen of our apartment in Oaxaca, Mexico in 2010 and on the left also in the Blithewold Garden in 2013. 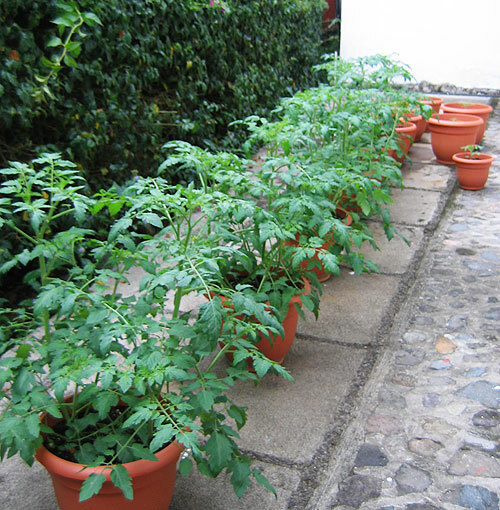 Planting and Care: I have tried growing these in my garden in Panajachel, Guatemala. It lies in the mountains at about a mile high and has a year round spring like temperature with very bright and hot sun. I have had no luck so far. 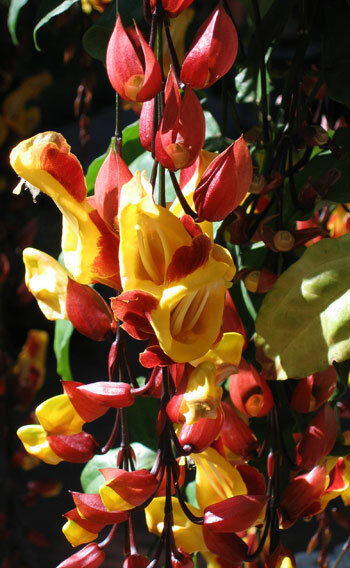 This stunner of a vine not only blooms most of the year, but does so without being too fussy. And, as you can see in the photographs you can have it in either the simple or the extravagant flowering form. 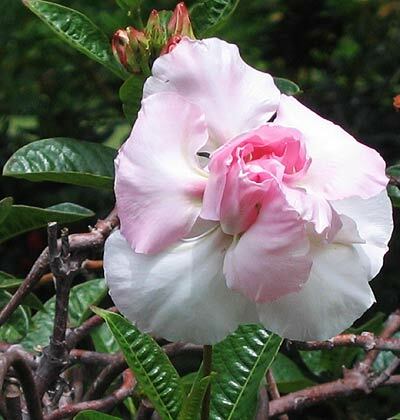 Benefits: The Thai rose is as attractive to butterflies and hummingbirds as it is to us. 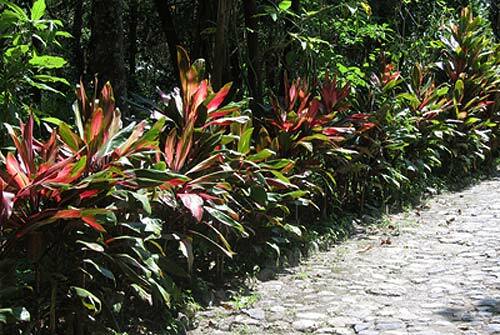 Photographed: On the left and right in the Botanical Garden at the Hotel Atitlan on Lake Atitlan in Guatemala in July of 2010. The photograph below was taken in the Winter Garden in Auckland, New Zealand, in 2014. Below that on the left and right in the Winter Garden in Auckland, New Zealand, in 2014. 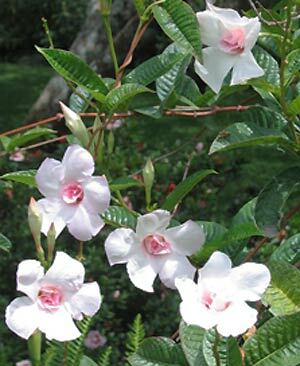 Planting and Care: This vine will be at its best in full sun or a bright semi shady area of the garden. Give it regular watering or routine rainfall. 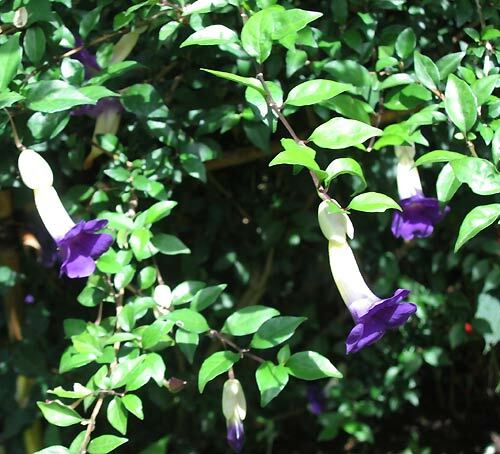 I never heard of these plants before arriving in Guatemala, but the whole family has quickly won me over. 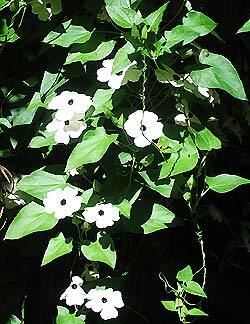 They are some of the most exquisitely beautiful, exotic and easy to grow vines I have ever encountered. 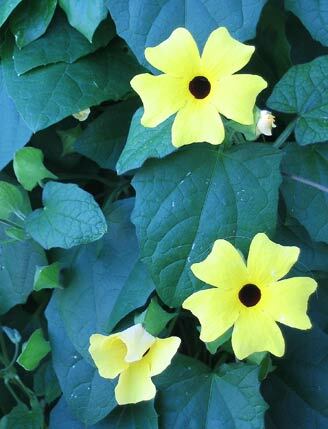 This is a delicate vine with small very appealing flowers ranging from white through yellow to orange and all have the distinctive "black eye." 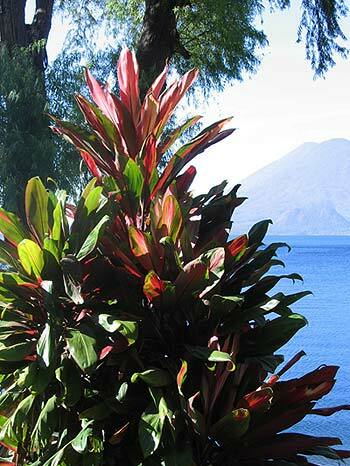 Photographed: On the left at the Hotel San Buenaventura on Lake Atitlan in Guatemala in May 2010 and on the right in the Thuya Garden, Mt. Desert Island, Maine, 2013. Planting and Care: This little vine likes it sunny and moist and will be a perennial once it settles in. It is not winter hardy. We planted a small clock vine to the side of a tree we didn't like much, but didn't want to cut down because of the shade it provided to our home from the blistering afternoon sun in Montserrat. In just a few years, the vine grew to the top of the tree and the vines beautiful flowers made a relatively unattractive tree a visual treat. Planting and Growth: This lovely vine likes a rich soil or a good bit of fertilizer along with regular watering or rainfall. It thrives in a semi shady location, but will handle a bit more sun if given adequate moisture. 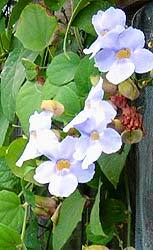 This is yet one more very appealing plant in the Thunbergia family. This one is less of a vine and more of a bush. We now have one in our front garden here at Lake Atitlan in Guatemala. It is recovering well from being recently transplanted. Benefits: Its lovely blue flowers are bee, butterfly and hummingbird attractants. Planting and Care: Set in a place with full sun and routine rainfall or watering this plant should do very well. 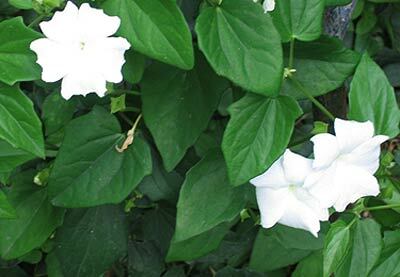 This is a very lovely light hearted quickly spreading colorful vine that should find a little space in every garden. Planting and Care: Full sun or semi shade will do fine for this little treasure as long as it gets regular rainfall or watering. It may even be winter hardy so give it a try. It will die back with the first real frost, but it may very well show up again in the spring. 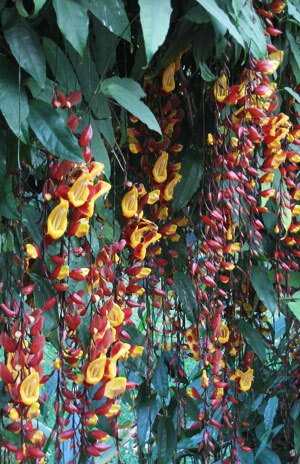 This is one of those serendipitous events because when visiting Panajachel I had seen and fallen in love with this vine. I brought seeds back to our home in Montserrat which we soon sold. Later, moving back to Panajachel we found a home with a thriving vine shading half of the large front terrace. How lucky is that?! 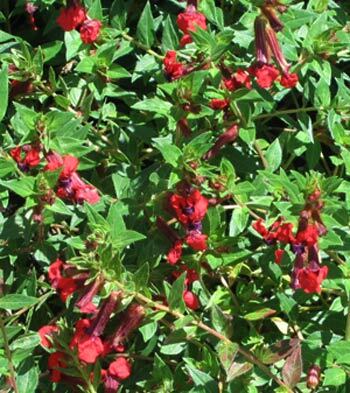 Benefits: This looker attracts butterflies and hummingbirds and produces endless flowers. Photographed: At our home and in others while we lived In Panajachel on Lake Atitlan in Guatemala. 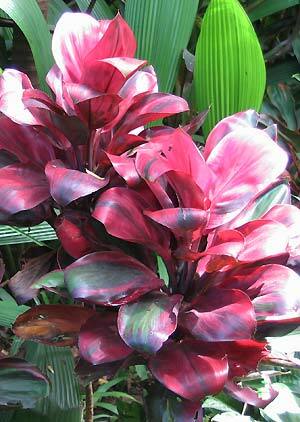 Planting and Care: This plant will do best in a semi shady area and will do fine with medium to low watering. I was recently warned by a new friend in Panajachel that this plant has to be severely cut back on a routine basis or it will take over the world. Maybe something so beautiful should be allowed to do just that. 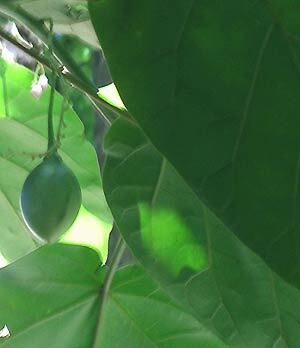 This is a very attractive fast growing vine. 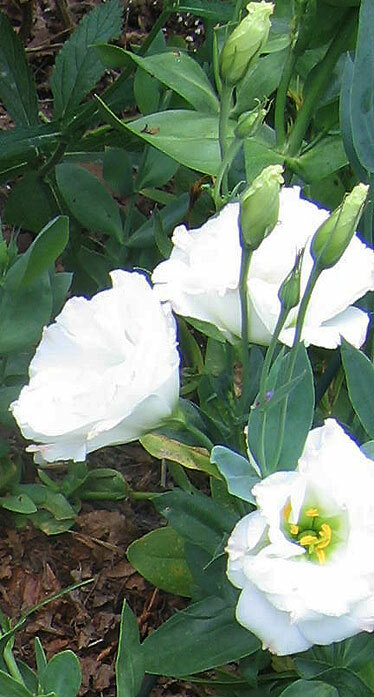 Its strikingly white flowers are like eye candy especially set against the dark green lush foliage. 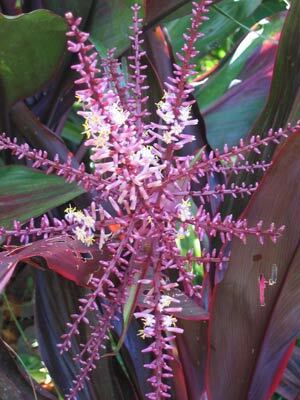 Benefits: As with so many tropical flowers, this one too attracts butterflies and hummingbirds. Planting and Care: This is a pretty easy going plant liking full sun or semi shade and routine rainfall or watering. When we were living in Montserrat, French thyme was preferred by people there as they knew it was preferred in the United States and Britain. 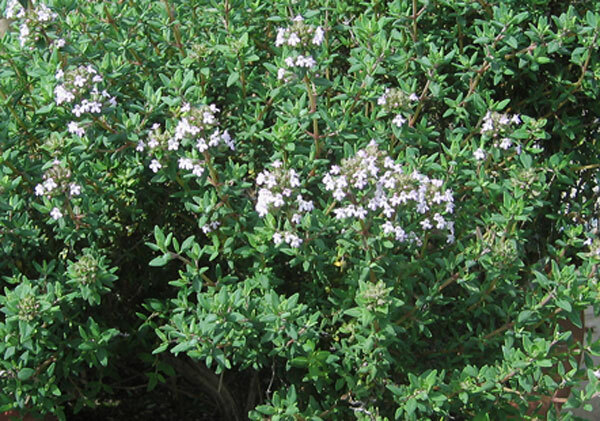 Sadly, in Montserrat it was very difficult to grow, less flavorful than the easy to grow Spanish thyme described below and it was extremely rarely available. Once in a great while in any year you will find a small bunch of French thyme for sale at an extortionate price in one of the roadside stands. Benefits: Thyme has many uses apart from its flavorful contributions in the kitchen. As a tea it is used effectively to treat everything from coughs and colds to headaches and hangovers. Photographed: Below on the left in the (Ortobotanico) Botanical Garden in Naples, Italy, in 2014. Below on the right in our garden at Lake Atitlan in the highlands of Guatemala. Planting and Care: The tough little perennial plants in the photograph below were grown from seed and planted out in our garden when they were very small and looking very fragile. 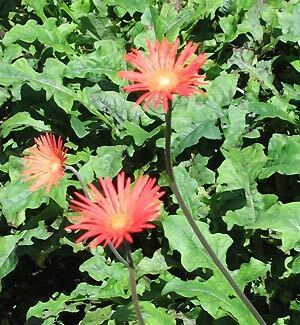 They have flourished and now live happily in a semi shady area of the garden with routine rainfall or watering. A now and again dose of fertilizer is always beneficial. This is truly a wonderful plant. 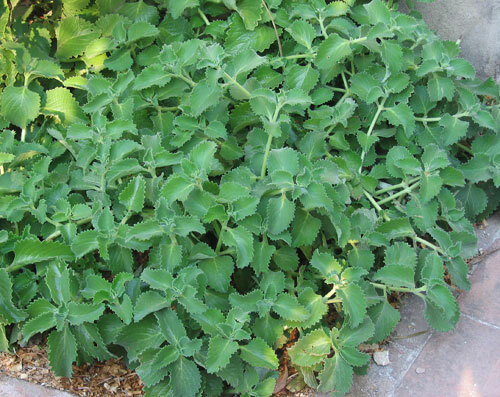 It is extremely easy to grow, performing more like a weed than a valued plant and it tastes better than French thyme! WOW, it doesn't get better than that! Aside from using it fresh from the garden in anything we are preparing that calls for thyme. 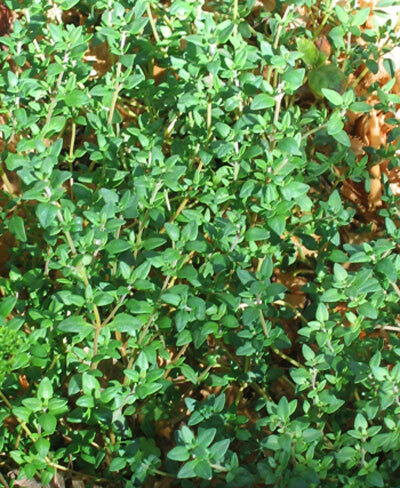 Benefits: This thyme is also used as a tea in Montserrat, but we don't know what the health benefits are apart from those we derive from having a lovely cup of tea. Photographed: Immediately below in our herb garden at our former home in Montserrat and below those in our herb garden at our home at Lake Atitlan in Guatemala. 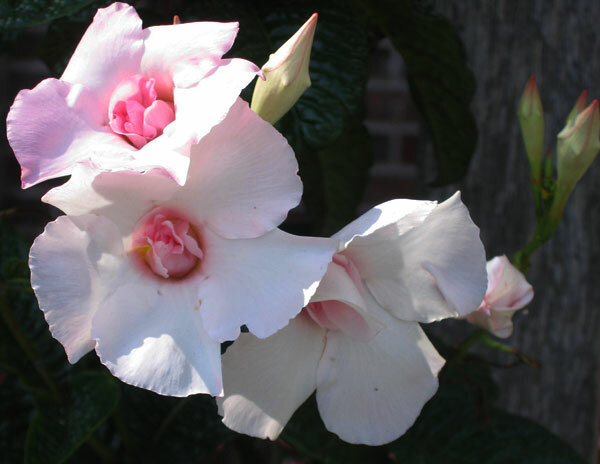 Planting and Growth: These fleshy plants are easy to grow and to propagate. 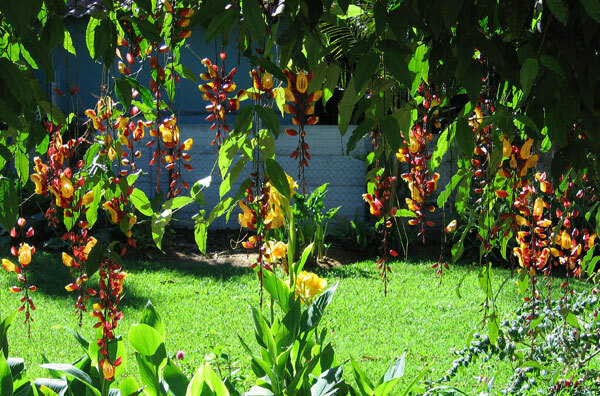 In the tropics pick a semi shady location for summer plantings or a sunny one for the winter. Take a six inch cutting from a healthy plant and stick it in decent soil. Give it some water and it will be off and running. 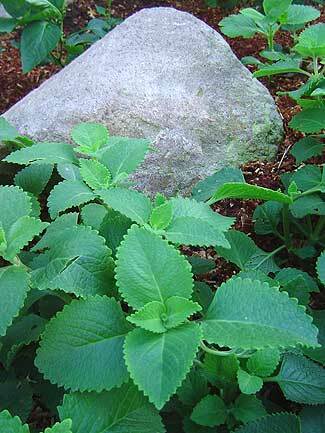 These plants are heavy feeders, so don't stint on the fertilizer, compost or manure when you can get it. After letting the original plant grow for a year, take a cutting and start over. These plants seem to age more quickly than most, loosing their beautiful appearance. Butter a 9" glass pie pan, place fish in the middle and cover with the sliced onions. Sprinkle the Cuban thyme leaves on top and grate the pepper over all. Cover tightly with a glass top or foil and bake in a 350° oven 45 minutes to an hour. When serving discard the cooked Cuban thyme leaves, but decorate the serving plate with a couple of fresh ones intermixed with yellow lemon wedges. Photographed: In our kitchen at our home at Lake Atitlan in Guatemala. 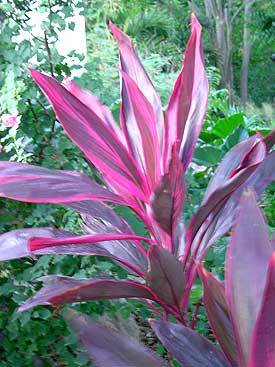 The bright red and deep pink leaves, or green and pink leaves or green and white leaves of the members of this family make a great addition to the non-flowering plants in the garden. The fact that it is a great survivor as well puts it high on my list of favorites! 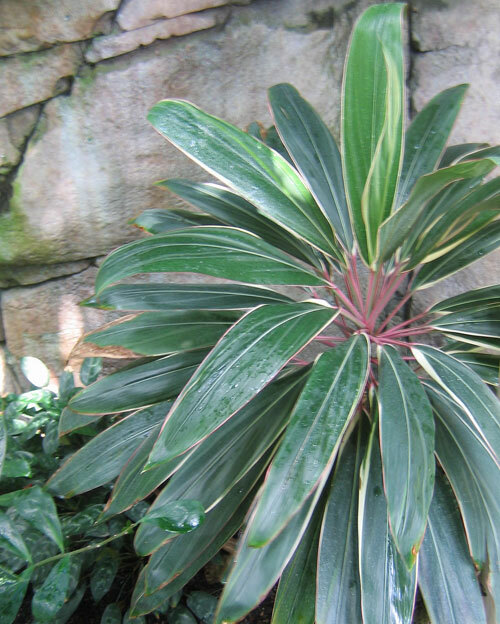 This very colorful leafy plant can grow to a height of about twelve feet. 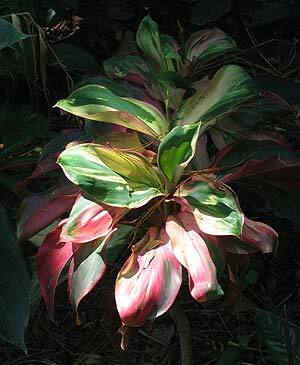 Its leaves are about fifteen inches long and are an appealing blend colors. 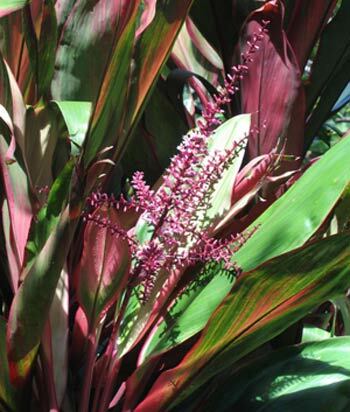 Planting and Care: Ti plants prefer bright shade to come into their own and they are very receptive to regular rainfall, but they don't need it to be beautiful. They also prefer a slightly sweet soil so add a bit of lime to the soil before planting if your soil is acidic. When they become leggy, simply cut off the main stems at a level where you want new growth. Then you can plant the pieces that you've cut off, hence having even more beautiful Ti plants. Landscape Architecture: This is a perfect plant for a shady location as its color will add spice to a mainly green environment. It also makes an interesting light hedge if establishing a border is more important than creating a privacy wall. Photographed: On the left At Hotel Atitlan on Lake Atitlan in Guatemala. On the right in our terrace garden at our former home in Montserrat. 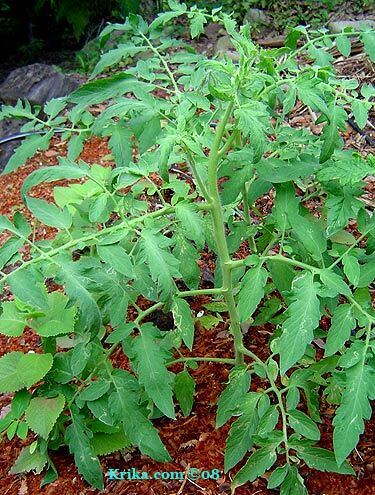 This wonderful very sensitive and attractive perennial plant produces the "green tomato" so essential in Mexican cuisine. 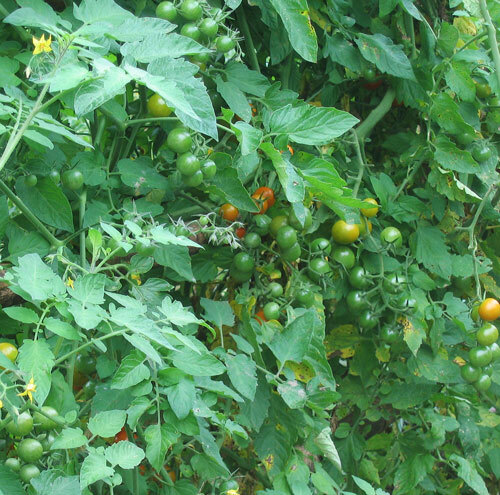 Its growth habit resembles the normal red tomato in some ways, but it does become a rather large plant in a short time if all goes well and in so doing it produces lots of tomatillos. When ripe these are light green roundish fruits covered in the peculiar tomatillo papery wrapping. 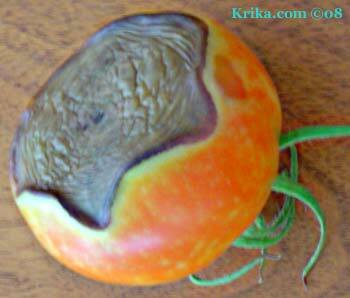 Slip off the covering to find the green tomato which before washing has a slightly greasy feel. After washing, tomatillos are usually cooked and included in an upcoming meal, either as a broth base to a stew such as clamoli, or a "gravy" to a dish such as queso cilantro or enchiladas suizas, or simply as a green salsa for tacos or whatever meal you may be enjoying. They are delicious and once cooked they can be frozen for future use. I have even frozen them well washed and raw with great success. Apparently this newly discovered substance, with anolides is a potent cancer fighting chemical. So make some salsa and enjoy. You'll be much healthier for having done so. Planting and Care: If you have a lot of seeds, plant them directly in the garden where germination will be very limited as is usual in the tropical Caribbean. With access to few seeds, I always used a starter soil mix that I made and got the seeds off and running as small plants before I set them out in the garden. 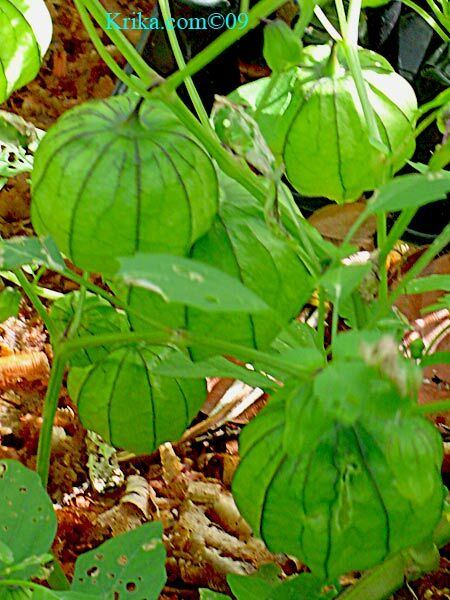 The tomatillo may be treated much as a tomato plant and is subject to the same pests and diseases. They are very vulnerable to dustings of volcanic ash and to the acid rain that we often got in Montserrat because of the activity of the Soufriere volcano. Tomatillos may be staked as you would with tomato plants, but in our location the high winds seemed to tear staked plants apart. So, instead of staking, I layed flexible seed starter trays on the ground and lay the tomatillo laden branches on them to keep them from direct contact with the soil. This proved much easier than staking and much more productive as our plants did not suffer as badly in the high winds. I consider the tomato one of the essential food groups. Red ripened in the garden or field, there is just nothing better. In New England I canned dozens of quart jars each year to enjoy in the coming winter. I could and have eaten them every day of my life when I could find freshly grown ripe red ones. 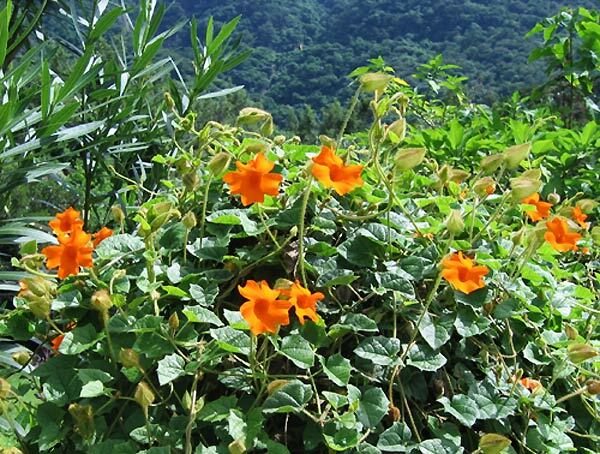 Like so many of our favorite plants, they originated in Central and South America. Tomatoes may be beneficial to your skin. Force a tomato through a sieve and apply the pulp and juice directly to your face. Rinse off in the shower in about 15 minutes. A diet high in tomatoes also provides a natural low level, sunscreen, helping to reduce UVA and UVB damage. Tomatoes are said to be highly nutritious, providing fiber, and vitamins A, C and K. If that were not enough, they also provide us with potassium and manganese along with amino acids needed for protein synthesis, including lycopene now believed to help prevent some forms of cancer and maybe even lessening wrinkle damage. Frequently eat cooked tomatoes because that increases their dietary benefits. Be sure you aren't getting your tomatoes from a can. Buy your organic tomatoes fresh when you can find them and your organic tomato sauce and paste in glass containers. When we have traveled in Italy, a part of the EU, all tomato products are sold in glass. It is more expensive in the short term, say .20 cents a pound, but how much does cancer treatment cost? 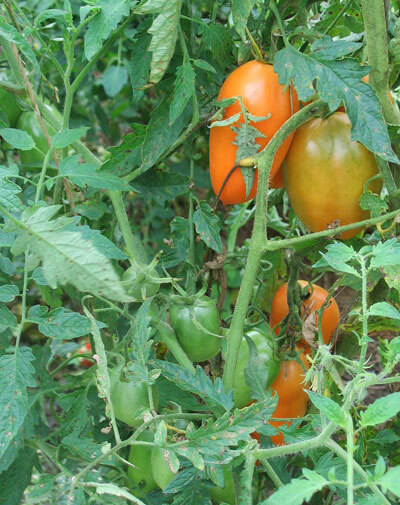 Varieties Suitable for Tropical Climates: Two of our favorites are Calypso, a small round tomato, and Sweet 1000 the best of the cherry tomatoes we have ever had. Each of these did well in Montserrat. Surprisingly, we visited the $20,000 government financed greenhouse of a local farmer, Daniel James, and he showed us his beautiful stand of Rutgers plants loaded with green tomatoes for the second or third time according to Daniel. I would not have expected this variety which did beautifully in New England to be so productive in the Caribbean which goes to show it is always worth experimenting. We've heard that Solar Set is a good variety to grow in Florida so it may work well in the Caribbean as well. Photographed: In our garden at our home in Guatemala in 2014. Photographed: On the left in our upper garden at our former home in Montserrat. On the right in the Blithewold Garden in Bristol, Rhode Island 2013. I find it amusing that for years the majority of junk foods have been colored orange. Now, orange fruits and vegetables are being touted as the healthiest things you can eat. Go figure, how so many years ago food manufacturers decided that orange was the best color for junk food. This very strange problem occurs when there is a calcium deficiency along with an excess of nitrogen or water. Nitrogen in the form of ammonia especially is a major suspect in causing the problem. The solution is not difficult and you need not remove plants or plant materials as there is no disease component to the problem. First, begin watering the soil regularly so there are no extremes of soil moisture levels. Second, test the pH of your soil if you can or simply add lime at the following rate: one half pound of lime for every 10 square feet of garden space. This should raise the soil pH by one number. If the problem persists, do a second lime treatment and wait awhile to see what happens. Regular watering and raising the pH of the soil should do the trick. This process worked like a magic trick for our tomatoes and we'll now be using it with our green pepper plants which have had the same problem. Surprisingly in Montserrat where we routinely had extreme acid rain and acidic volcanic ash situation there was no lime of any kind available to farmers or backyard gardeners. Go figure, when we had six just under US $20,000 each Department of Agriculture financed greenhouses awarded to local farmers. Can you imagine greenhouses in the Caribbean? The UK foot the bill for these greenhouses as Montserrat is some sort of 'protectorate. Benefits: Much as we do, butterflies hummingbirds find this plant particularly appealing. Planting and Care: Full sun and routine rainfall or watering will keep this one and a half to two foot tall plant blooming for many months. This is a strikingly attractive ground cover with appealing foliage and very pretty flowers that seem always to be blooming. 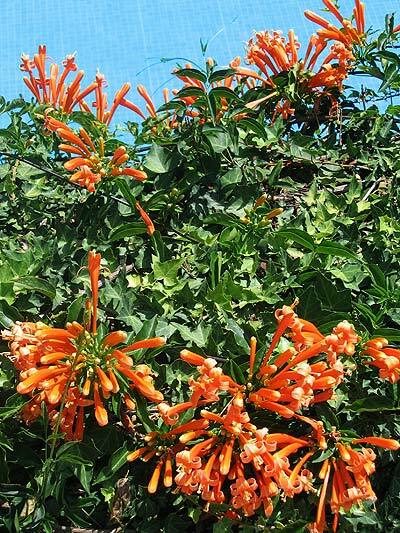 Benefits: This plant is a favorite of both butterflies and hummingbirds. 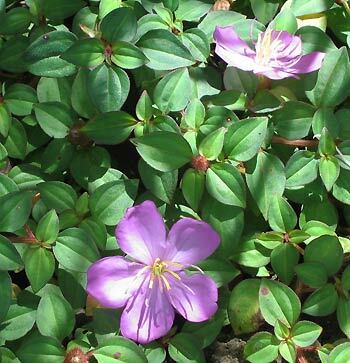 Planting and Care: Tibouchina will grow in full sun or in a semi shady area as long as it has regular watering or rainfall. For those who would like the plant but live in a cold climate, make a home for it in a hanging basket that can over winter inside your home. 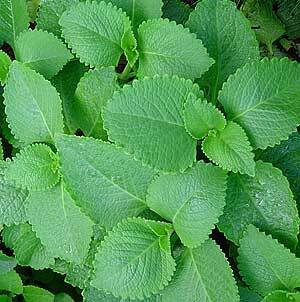 Planting and Care: Plant this lovely perennial in full sun or in a bright semi shady area of the garden. Give it routine watering or rainfall and watch the show. Be careful not to over water. This is a tropical or semi tropical plant so it is not winter hardy. This is a very appealing little tree. Growing only to about 16 feet in height it can be easily accommodated almost anywhere the climate is warm. Photographed: (Tree and flowers) In the Palermo Botanical Garden in Sicily, Italy, and (fruits) in the Botanical Garden at the Hotel Atitlan on Lake Atitlan in Guatemala. 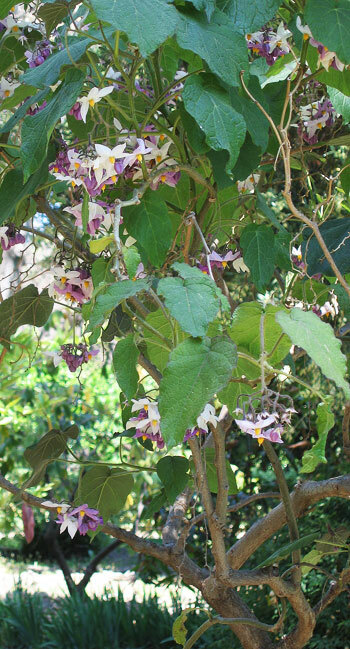 Planting and Care: This small fruiting tree often grows at the edge of forests where it enjoys a bit of shade. Depending on the amount of sun it receives it likes more or less water. 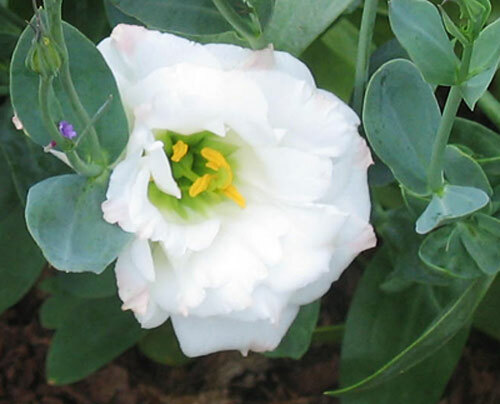 It is tolerant of soil types, but always prefers it to be well drained. Benefits: I have long known of the good qualities of snacking on a couple of raw almonds daily. Yahoo News has even more to say about this delicious nut, "Almond eaters... lowered their blood pressure, and the vitamin E in these nuts may keep skin supple." This is a large tree growing to over 100 feet in height, though I have almost always seen it trimmed of its top. It also seems to grow in tiers with heavy thick branches coming straight out from the trunk. 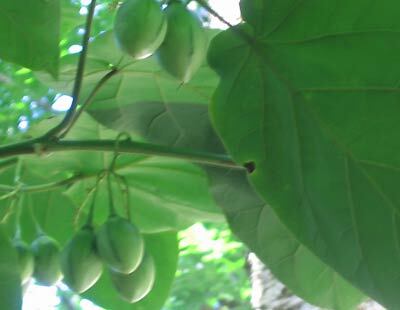 Its leaves are large, leathery and shiny and normally deep green in color. Before shedding its leaves to produce new greenery they become deep red much as they would in a New England autumn. 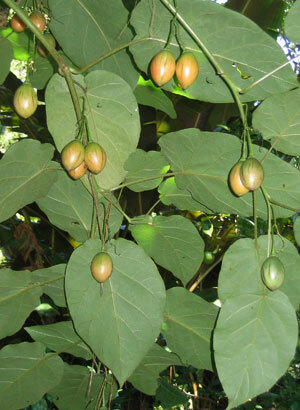 Benefits: The seeds it produces are edible in their entirety and are said to be delicious by folks in Tobago. 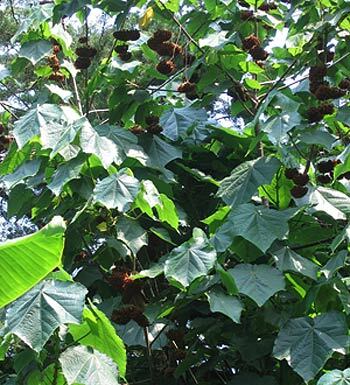 As well, this tree has many chemical components that have made it useful in herbal medicine. 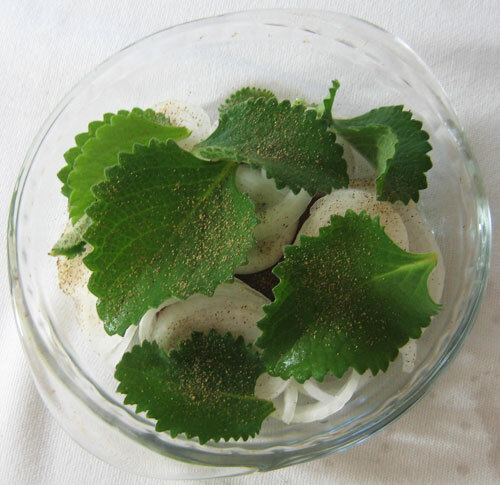 Its leaves have also been used to lessen microbial activity in aquariums and in fish farming. 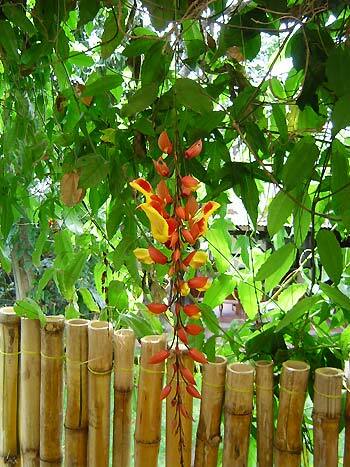 Planting and Care: For this tree you will have to place it in a tropical climate garden so it will grow in full sun. It is accepting of all types of soil as long as it drains well. 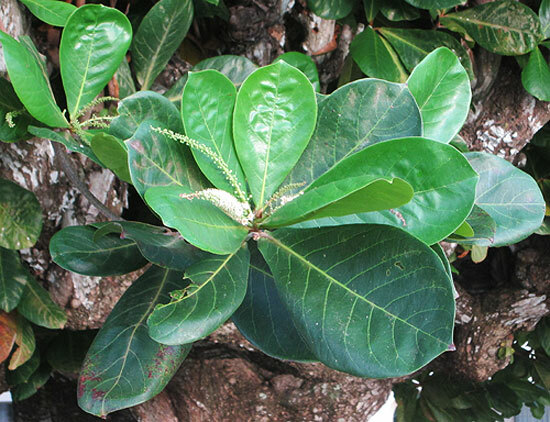 The tropical almond tree is drought and salt air tolerant making it perfect of island life. This is a visually striking medium sized tree that I stumbled upon in a very unexpected Botanical Garden we discovered when we visited Panajachel on Lake Atitlan in Guatemala. We hadn't been to the small town in more than twenty years and almost all the changes we have seen are just fine with us. I really can't think of another place I could say that about. Can you? Planting and Care: Plant in bright sun and make sure it receives regular rainfall or watering. It is a fast grower and a lovely bloomer so enjoy! 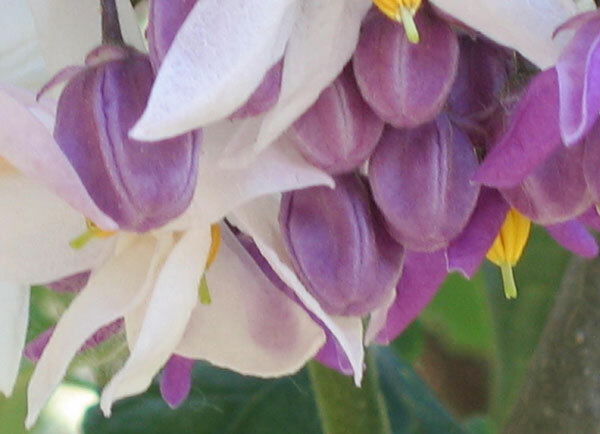 This is a common vine in warmer climates where its ease of care and its exuberant growth make it very popular. From: The middle and southern latitudes of S. America -- Brazil, Paraguay, Bolivia and Argentina. Photographed: By the pool at the Hotel Riviera on Lake Atitlan in Guatemala in 2010. Planting and Care: Grow this vine in full sun or bright semi shade for the best results and give it routine rainfall or watering. Tumeric is one of those flavorful spices found most commonly in Indian food. Apparently, it also has proven itself beneficial in treating a range of health problems. Its roots or rhizomes, resembling those of ginger, are dried and ground into a powder to produce the spice we know as tumeric, one of the main ingredients in curry powder and one used as a flavoring all by itself. I read somewhere recently that tumeric was the magical cure all food of last year, soon to be replaced by the newest and latest cure all food. I would never be one to completely dismiss health claims, but realistically speaking, does anyone think that any food they eat is "THE ONE?" If so they would be excellent candidates for my Brooklyn Bridge Sales Program. We recently got to know well an Indian woman from Britain who told us that her Indian heritage was Sikh. Given that we spent a lot of time together cooking, she also volunteered the information that traditionally the Sikhs use tumeric to flavor most of their food. They do not use curry. It would be interesting to see the health statistics on Sikhs so see if their rates of illness are appreciably different from closely matched Indians who were not Sikhs and did not use tumeric so exclusively. The main life saving qualities of tumeric seem to be its ability to fight inflammation along with its tumor and arthritis reducing capacity. All that being said, I use tumeric in my bread and butter pickles and whenever I make Indian food and I am looking forward to soon being cured of whatever ails me! THE FOLLOWING INFORMATION HAS BEEN GATHERED HERE AND THERE AND SHOULD BE ACCEPTED AS SUCH. 1. Curcumin, found in tumeric, has proven to be an effective natural herbal anti-depressant. 2. 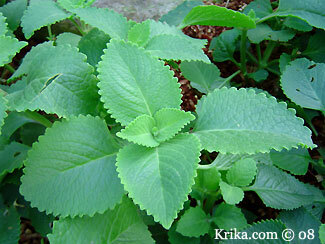 It has also been reported as an effective treatment in digestive disorders. 3. It has both antioxidant and anti-inflamatory qualities. 4. On the down side turmeric may slow blood clotting. 5. It makes a fabulous natural yellow dye and it may repel both ants and mosquitoes. 6. It has been said that its health giving qualities are greatly improved if it is cooked with black pepper. 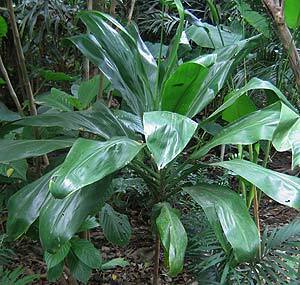 Planting and care: Tumeric grows most happily in a shady spot in the garden, but will tolerate some sun. 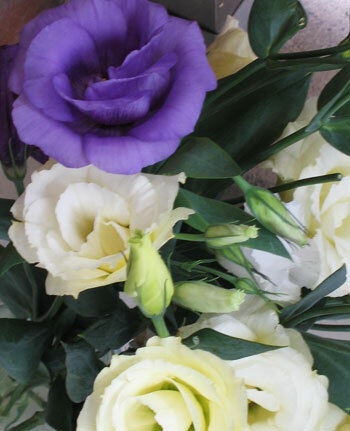 It is fond of water and rewards us for good care with lovely funnel shaped yellow flowers.